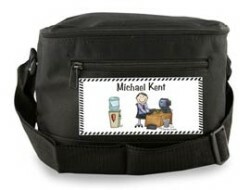 Personalized 6 Pack Size Lunch Sacks by The Personal Note. Use our Logo Sets and CharacterFaces to create your own special moving Cards. 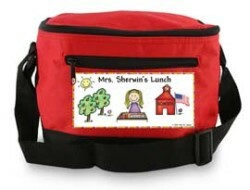 Logos and Character Choices combine to create your own special lunch box. 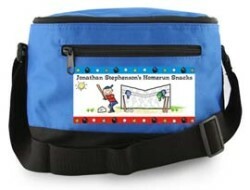 Zipper closure and zippered front pocket with rear mesh pocket. Use any one line of copy. Theme Layouts as shown below. Available in Black, Red or Royal Blue. Stick Figure Design Copyright © 2007 Pen At Hand/Ronnie Horowitz All rights reserved.